This tape was first added to the archive on December 22nd, 2010 as a 2nd generation cassette tape. I received a DAT clone transfer from the good people of BowieStation. This transfer has no hiss and includes Bowie's set, thanks to the DAT transfer. Only gripe is that it was transferred analog out instead of digital. But the sound is upgraded from my cassette transfer. Terrible Lie fades in. This comes from a 2nd generation cassette taped transferred by me. Thanks to Mr. Fang for sending the cassettes. Very good recording. Fades into "Terrible Lie" a little bit. 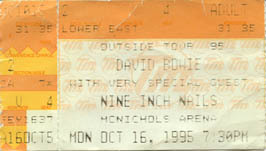 This is only the NIN portion because at the time of this tape being transferred, I only archived the NIN sets. I thought I would keep this up on the archive if you prefer one transfer over another.